“What might this be?” That such an innocuous question should tap our collective imagination, reveal the power of perception to both shape and reveal one’s character, and to prove a resilient tool for interpreting the human psyche is nothing short of astounding. And yet Hermann Rorschach’s ambiguous yet carefully planned inkblot drawings, begun in 1917 and published in 1921, did exactly that. But not without enduring controversy. In this broad yet richly nuanced book, literary translator Damion Searls gives to English readers for the first time the remarkable story of the Swiss psychiatrist whose iconic test provoked interest and head–shaking everywhere. Rorschach trained as a draughtsman and visual artist prior to his psychiatric training with Eugen Bleuler, at the time the most respected psychiatrist in the world. It was Bleuler who labeled the disease we call schizophrenia, and coined the terms autism, depth psychology, and ambivalence. He spoke up for Freud in 1904, giving the non-academic doctor a crucial imprimatur. Rorschach was a colleague of Jung, Freud, and other icons of 20th century psychiatry. More than that, Rorschach was deeply humanistic. His work intersected art, science, literature, anthropology, myth, religion, and popular culture. 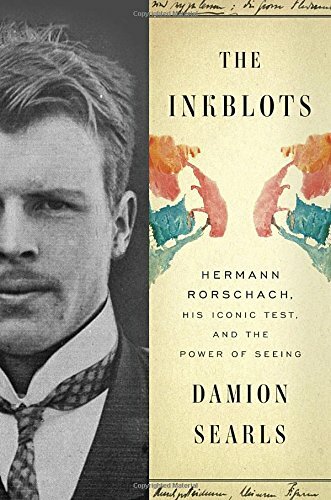 No psychological concept has penetrated culture as much as “the Inkblot test” has. As Searls puts it, Rorschach’s discovery—reached empirically rather than advanced from any theory—essentially maintained, “that who we are is less a matter of what we say, as Freud thought, than what we see.” Or what we do and how we act. While the test eventually fell out of favor in German–speaking countries, it became enormously popular in America following its introduction by Chicago child–psychoanalyst David Levy in 1924 (only two years after Rorschach’s untimely death from a ruptured appendix at the age of 37). It was Levy who invented play therapy, coined the term sibling rivalry, and translated Rorschach’s seminal essay into English. But differences are precisely what are revealing. Controversy continues today about the meaning and reliability of the inkblot test. Searles’ account of Rorschach’s posthumous reputation is equally rich with entertaining and unexpected details.